A friend of mine wrote a creepy short story to accompany this photo I snapped yesterday. I think it’s a perfectly haunting, eerie tale, most appropriate for the ghoulish season upon us. 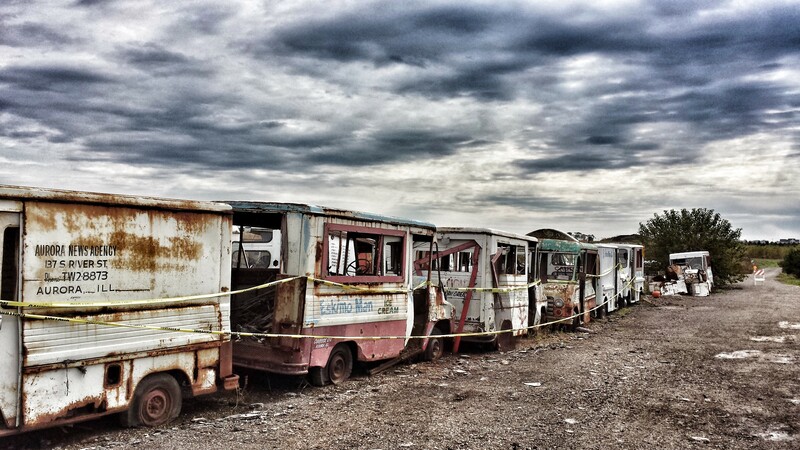 It wasn’t a junkyard, it was a graveyard, where the hopes and dreams of all those lost summers went to die. Or so it appeared, at least. But if you were to look closer, inside those trucks, you would see an ice cream wrapper, and a few popsicle sticks. And combs, and house keys, and small pairs of glasses, and hair barrettes, and notes from the principal. Because on those shiny summer days when the trucks trolled the streets, they drew the children in with promises of sweets, and devoured them. When satiated, the trucks came back here, to this lost place, to hibernate, and wait for summer to come again. And when summer arrives, they will throw off those disguises, and once more they’ll be bright and shiny as they drive slowly along the streets, playing their Pied Piper songs, the tinkling music drawing in the children, their prey. And when they have eaten their fill, back they’ll go, to the desert, to wait for another year. So it has been for thousands of years. Their shapes and methods have changed to fit the times, but their evil remains. My suggestion? Buy your ice cream at the grocery store.